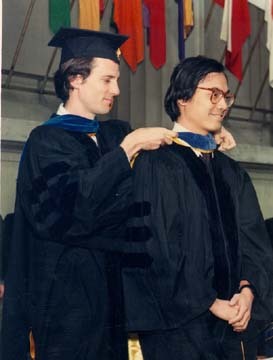 Shin-Yuan Tzou, my first PhD student. I'm 'hooding' him. Greek Theatre, UC Berkeley, 1990. Bo Yu in the process of becoming Bo McInnis. 1997. Pamela Chan, my last student (Master's degree, ~1991). 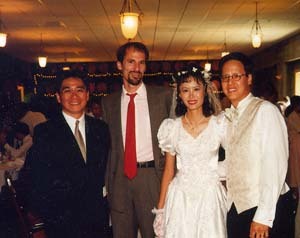 Pamela again, at her wedding to Mike Fang, 1997. Yoshi Osawa, an old friend and collaborator, is on the left.